The Royal Society of Chemistry (RSC) is a journals, books and databases, as well as hosting conferences, seminars and workshops. It is the professional body for chemistry in the UK, with the ability to award the status of Chartered Chemist (CChem) and, through the Science Council the awards of Chartered Scientist (CSci), Registered Scientist (RSci) and Registered Science Technician (RScTech) to suitably qualified candidates. The designation FRSC is given to a group of elected Fellows of the society who have made major contributions to chemistry. The names of Fellows are published each year in The Times (London). Honorary Fellowship of the Society ("HonFRSC") is awarded for distinguished service in the field of chemistry. The president is elected biennually and wears a badge in the form of a spoked wheel, with the standing figure of Joseph Priestley depicted in enamel, mainly in red and blue, on a hexagonal medallion in the centre. The rim of the wheel is gold, and the twelve spokes are of non-tarnishable metals. The qualification GRSC (Graduate of the Royal Society of Chemistry) was awarded from 1981 to 1995 for completion of college courses equivalent to a chemistry degree and overseen by the RSC. It replaced the GRIC offered by the Royal Institute of Chemistry. Dalton Division, named after inorganic chemistry. 6 Subject Groups. Environment, Sustainability and Energy Forum. 3 Subject Groups. Materials Chemistry Forum. 4 Subject Groups. Industry and technology Forum. 13 Subject Groups. There are 12 subjects groups not attached to a division or forum. Books for students, including the Tutorial Chemistry Texts series of 23 books, edited by Professor E. W. Abel, and the 8 books in the Molecular World series, whose coordinating editor is Professor L. E. Smart. The the Green Park tube station or Piccadilly Circus tube station. The events have attracted notable science writers such as Philip Ball, Antony John Williams and John Emsley to give public lectures. Most of these are available as archived video streams via the RSC's Reaction website. Although opened as the Chemistry Centre in 2010 the building has been occupied by the Royal Society of Chemistry since 1857 (at which time it was known as the Chemical Society) – the heart of the Chemistry Centre is the RSC's Library and Information Centre which itself dates back to 1842. Over the years the library for the RSC has received many gifts from notable fellows including Michael Faraday. The library became a centre for information on the chemical sciences during the 1st and 2nd world wars when extensive use was made on the chemical reference material available. 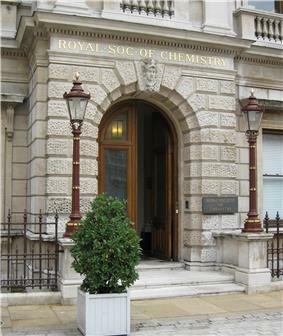 In November 2014, the society announced that the centre would be rebranded as simply "Royal Society of Chemistry at Burlington House" and the name "Chemistry Centre" dropped. 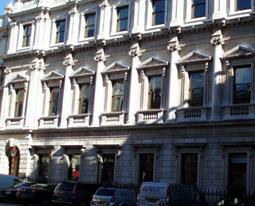 The Society has a large library covering mainly Chemical-based subjects, including online access for members, housed at the Chemistry Centre at Burlington House. It is part of the Chemistry Centre and is a resource for RSC members, although the public are also welcome. ^ a b c d e Lagowski, J. J. (1991). "A British Sesquicentennial," Journal of Chemical Education, Vol 68, No. 1, p. 1; acknowledging the sesquicentennial of The Chemical Society in London, which eventually became the Royal Society of Chemistry. ^ "RSC History". Rsc.org. Retrieved 2013-01-08. ^ "RSC Contacts". Rsc.org. Retrieved 2013-01-08. ^ "RSC Web page MChemA". Rsc.org. Retrieved 2013-01-08. ^ "RSC prizes and awards". Rsc.org. Retrieved 2013-01-08. The Faraday Division annually awards the Marlow Award for contributions to physical chemistry or chemical physics by members of the Faraday Division under the age of 32. Recent recipients include Andrew Orr-Ewing, (1999), Jonathan A. Jones, (2000), Helen Fielding (2001), Jonathan Essex (2002), Daren Caruana (2003), Jonathan Reid (2004), Julie Macpherson (2005), Fred Manby (2006) and Alessandro Troisi (2007). Corday-Morgan medal recipients include George Porter (1955). Later recipients include many of the current leaders of the chemistry community in the United Kingdom. Previous winners of the Harrison-Meldola Prize (known as the Meldola Medal and Prize prior to its merger in 2008 with the Edward Harrison prize) include Christopher Kelk Ingold (1921, 1922), Cyril Norman Hinshelwood (1923), R.H. Stokes (1946), D.H. Williams (1966) and J. Evans (1978).